If you love playing fantasy games then playing casino games would be a natural fit for you. Many Americans who are involved in football fantasy pools often bet on sports and play real money casino games as well. If this sounds like something you might be interested in then check out the NewSlotsGames.com website for information on playing the best USA online casino games. Let's start things off by going through some IDP news, notes, and commentary from Week 14 of the NFL season. Blidi Wreh-Wilson suffered a separated shoulder this week which knocked him out of the game early. Initial reports suggest that he could be headed for injured reserve. The Titans figure to move forward with Coty Sensabaugh in his place. Bills safety Da'Norris Searcy left Sunday's Week 14 game at Denver with a hamstring injury and did not return. Cornerback Ike Taylor took himself out of Sunday's Week 14 win against the Bengals due to a knee contusion. Ike Taylor says he took himself out of Sunday's Week 14 win against the Bengals because of a knee contusion. William Moore was sidelined in Monday Night's game with an ankle injury. Antoine Cromartie is believed to have injured a peroneal tendon in his ankle and may not be as serious as originally believed. There will be more updates later in the week. Sio Moore came into last week's game playing through a hip injury. He played all but one snap, but appeared visibly bothered by his injury still and only came up with single solo stop. Let's keep an eye on the practice reports and see how he's doing before we place him too high in our rankings. Top 10 fantasy DB Rashad Johnson was completely shut out of the box scores this week. There wasn't anything in particular driving his poor fantasy performance, it just looks like one of those games where he wasn't around the ball. 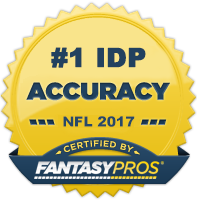 Now onto The Guru's IDP waiver wire selections for Week 15! DE Damontre Moore (NYG) - With Mathias Kiwanuka and Robert Ayers recently placed on IR, Moore received a big bump in playing time last week against the Titans (45 of 60 snaps) and he came through with 2 sacks. He'll square off against a Redskins team this week that is allowing the 4th most points to defensive ends, making him a nice DL3 spot start in moderate to deep leagues for those battling for a fantasy championship. DE Jacquies Smith (TB) - Smith has quietly stacked up 6 sacks in his last 6 games since taking over a more prominent role in the Tampa Bay defense. The Panthers aren't a great matchup, but he's hot right now and worth a shot as a DL3 in 12 team leagues. DE Frostee Rucker (ARZ) - Rucker is coming off a 2 sack game against the Chiefs and is pitted against the Rams this week who have given up the 7th most sacks in the NFL. He's still just a rotational player, but worth a look as a DL4+/DL3- in leagues that reward more heavily for big plays. ILB Craig Robertson (CLE) - If Robertson's still available in your league, now is the time to pick him up. It sounds like Karlos Dansby is close to returning, but may miss another week. If that's the case, Robertson is a nice lower end LB2 and deserves to be in most starting fantasy lineups. WLB Vincent Rey (CIN) - As long as Vontaze Burfict is out, Rey is going to continue to rack up tackles in bunches. He plays on the road this week, so we can expect a more favorable stat line than what we typically see from his home stat crew. It will be important to keep a close eye on Burfict's status, but given the myriad of fairly serious injury issues he's had this year, I'm not overly confident he returns this week (let alone this season). SLB Gerald Hodges (MIN) - When given the opportunity, Hodges has shown a knack for being a producer on the field. The injury to Anthony Barr opened the door for him to see some starter snaps and he registered 8 total tackles and a pick six. If Barr misses another game, Hodges remains a high variance LB3-. SLB Devon Kennard (NYG) - Kennard has gotten to the quarterback 4 times in his last two games and appears to be making a case for a starting job in 2014. Not sure if I would trust him in redraft leagues this year, but he's definitely worth a roster spot in IDP dynasty leagues. A generous home stat crew, a general lack of tackle competition, and above average tackle opportunity makes him a potential breakout candidate in 2015. ILB Will Compton (WAS) - This is a deep league special pick. Compton is coming off a 14 tackle performance against the Rams and has another nice matchup against the Giants (in New York with their favorable stat crew). At this point in the season, it's hard to find an every down linebacker on a defense that is on the field a lot. If Perry Riley misses another week, owners in 14 and 16 team IDP leagues should take a hard look at Compton. S Ryan Clark (WAS) - With Brandon Meriweather nursing an injury, Clark had his best production since Week 4. With Meriweather's season in jeopardy and the Giants and Eagles next on the schedule, Clark makes for a sneaky DB3+ the rest of the season. S Pierre Warren (NO) - Warren has posted solid tackle stat lines of 5-2, 4-3, and 6-2 respectively over the last three weeks since taking over for Rafael Bush. He's got a top 10 matchup against the Bears this week. I'm projecting 7-8 total tackles this week. CB Bene Benwikere (CAR) - With Antoine Cason cut, Benwikere has assumed a full-time role at cornerback. The rookie 5th round pick out of San Jose State figures to be tested often by opposing quarterbacks. That should translate into solid production similar to last Sunday (6-2, INT). CB2+. CB Orlando Scandrick (DAL) - Scandrick is coming off his best fantasy performance of the season with 9 solos and 1 INT. He has a stellar matchup in Philadelphia next week and has a solid chance at 6 or 7 solos.